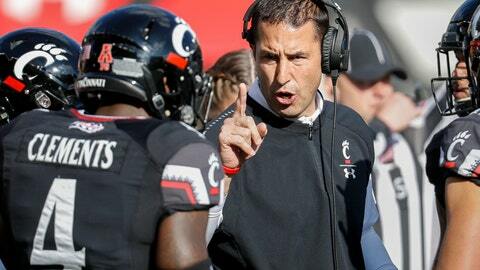 CINCINNATI (AP) — Luke Fickell doesn’t listen to sports talk radio while driving to his office at the University of Cincinnati each morning. He’s more a fan of ’80s tunes and country music. Twitter? He follows recruits, but that’s about it. The Bearcats‘ second-year coach hasn’t kept up with all the chatter about how he’s turned around a program that had bottomed out. After winning only four games each of the last two seasons, the 19th-ranked Bearcats (9-1, 5-1 American Athletic) are back on the football map. He’s got the Bearcats in contention for the league title as they travel to No. 11 UCF (9-0, 6-0) for a prime-time game Saturday on ABC, the biggest stage yet for Fickell’s young team. There are 35 true freshmen on the roster and 72 percent are underclassmen — one of the reasons their emergence was so unexpected. Not even Fickell would have predicted something like this when the season began. Instead, Cincinnati is off to its best season since 2009, when it went 12-0 in the regular season under Brian Kelly. He left for Notre Dame before the Bearcats played in the Sugar Bowl and lost to Tim Tebow’s Florida team 51-24. The Bearcats survived a few close calls early — an end zone interception in the closing seconds saved a win over Ohio — and have grown up faster than expected. Most of their experience is on the defense, which leads the league in fewest yards and points allowed. Three seniors anchor a line that is the unit’s strength. Sophomore running back Michael Warren II has already set a school record with 18 touchdowns, and redshirt freshman quarterback Desmond Ridder has been solid as the games have gotten more meaningful. Senior defensive tackle Cortez Broughton remembers the reactions he got preseason when he suggested the Bearcats had the ingredients to be a first-rate team. “People thought I was in different world, on a different planet,” Broughton said. They showed their inexperience before a 35-23 win over South Florida on Saturday night at Nippert Stadium. Several players exchanged words with the Bulls, and Fickell thinks that distraction played a role in Cincinnati’s slow start, with South Florida leading 16-14 at halftime. With the Bearcats headed for their first nationally televised game, Fickell talked to his players about keeping their emotions in check this week. “I don’t think we did a great job of it last week,” Fickell said. The most impressive aspect of the Bearcats in Fickell’s second season is how they’ve beaten teams that blew them out last year. They beat Navy 42-0 after a 42-32 defeat last season. South Florida dominated them 33-3 last year. And now, they face a UCF team that had its way in a 51-23 win last season at Nippert Stadium.